Organization of the Week: Save the Victory Trail & Jacobs Creek Bridge ~ The History Girl! This week, I am featuring a non-partisan coalition of concerned residents and American citizens dedicated to the preservation of Washington's Victory Trail, with an emphasis on the road leading to Trenton from Washington's Crossing, the site where Washington and his army crossed Jacobs Creek, and the historic through truss bridge that became part of that site 125 years ago. In September 2009, the bridge, built in 1882, was closed to vehicular traffic due to safety concerns. Mercer County proposed a new bridge and alignment for the road, which would have a detrimental effect on the rural landscape and character of the area. For a number of years, this coalition worked with the New Jersey Department of Environmental Protection, Preservation New Jersey, and other individuals and organizations to convince Mercer County to rethink their decision. Ultimately, between September and October 2011, the bridge was dismantled and is expected to be reconstructed at Howell Living Farm. 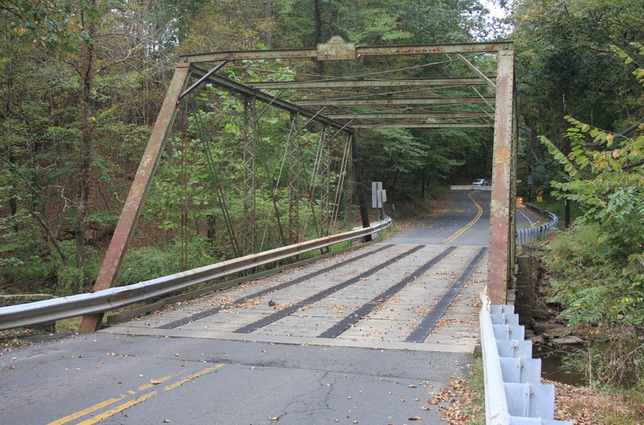 Although this coalition did not achieve its main goal of saving the bridge in its original location, the vigor and spirit of this group should be recognized for their efforts to preserve this small, but significant piece of New Jersey history. For more information about the bridge, the coalition, videos, and photos, visit www.savethevictorytrail.com.